I went into Lush armed with a gift card, my 'leave me alone face' to ward of the super eager all over me staff and looking for some new to me treats. My skin has been freaking out this summer, I get these bumps - not acne more like blisters and I blame the heat. Everything feels to harsh or drying even on my normal-oily skin. So I saw Kalamazoo and though it was dubbed a beard wash it said it could be used as a face wash as well. 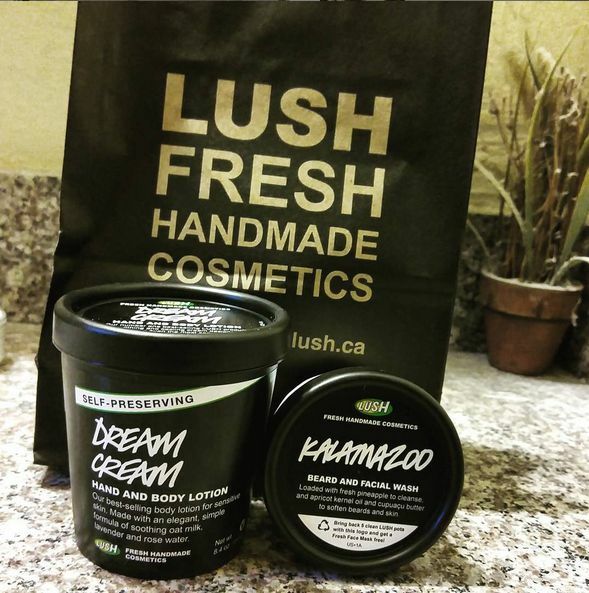 The creamy texture, the you know it comes from Lush clean-herbal scent and the newness factor had me buy a tub. I have been using it for about a week and really like it. I notice my dry patches are not so bad, inflamed areas less inflamed and it is gentle enough to remove the stubborn black trails my mascara leaves down my cheeks after getting some sleep. Kalamazoo is packed with gentle cleaning stuff like almond oil and grime busters like citrus oils. If you like a cold cream type texture for your face you should give this a spin. I bought the small $9.99 size but will splurge on a bigger size next time to share with the beardless but sensitive skin boyfriend. Hahah I love the "leave me alone" face sentiment. I've had to come up with my own system of avoiding their upsells because I think my "leave me alone" face somehow made me more approachable. I've always passed by Kalamazoo, but I wonder if my dude would be into it. He's not a face washing kind of guy, but he does often complain about regrowth itchiness.